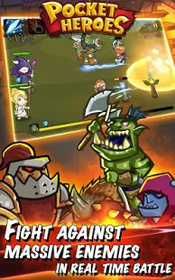 Pocket Heroes is a role playing game for android. 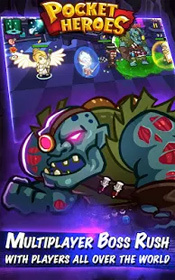 download last version of Pocket Heroes apk + Mod for android from revdl with direct link. Enter a world of epic fantasy combat now! 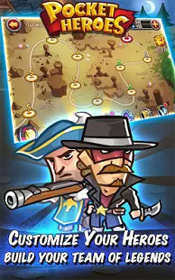 Pocket Heroes is a great roleplaying and real-time strategy game, here you can raise an elite team of heroes, each with their own amazing abilities, and lead them in frantic real-time battles against monsters. Enter a Kingdom locked in battle where swords, guns and magic clash. Carve a path through countless monsters, battle the Cyclops, the desert worm, a giant man-eating plant, former brothers in arms, and even a dragon on a holy crusade against cunning and powerful demons who have tainted Camelot. King Arthur is murdered by demons and the realm plunges into chaos. As the sole survivor of the attack, you, Sir Eric, commander of the royal guard embark on a quest to avenge King Arthur and restore order to the Kingdom. • Build a powerful team from numerous character classes, and fight crazy monsters in real-time battle! • A challenging and fantastic world of over 80+ enemies, including tiny goblins, great dragons, angry orcs and noble elves! • Travel in the kingdom of King Arthur and complete your legend story in so many beautiful scenes. • Converting your heroes and customize them with 100+ spells! Summoning an angel, or becoming an angel? Your choice! • Over 800+ equipment to collect! Upgrade your equipments and become best of the best! • Share your feats for bonus, and share your fun of this awesome roleplaying game with friends! • Challenge boss together with players all over the world!